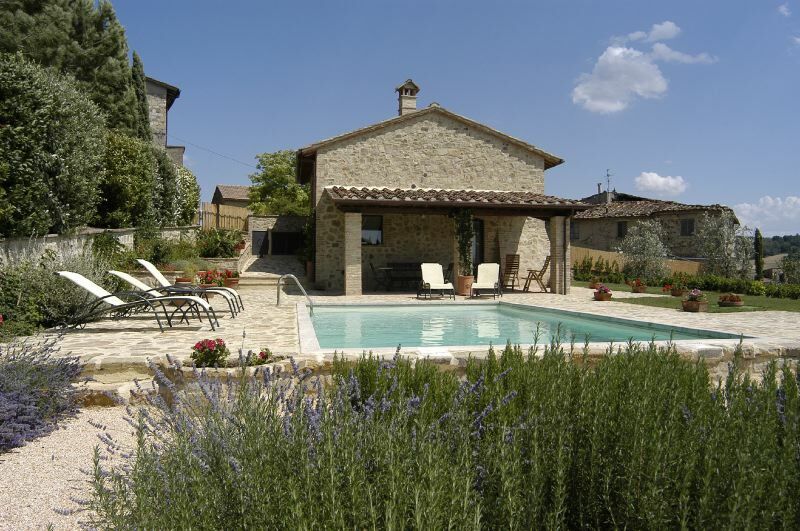 This is an attractive property in a splendid, panoramic position in the Chianti hills, consisting of two ex-haybarns about 50 metres from each other. The barns have been recently renovated and furnished with great care and good taste. A nice garden, very well-looked after and completely enclosed, surrounds the property on three sides. The swimming-pool lies right in front of one of the barns, whereas in front of the other barn is a large, furnished, panoramic terrace and a gazebo. Guests have the use of a wood-burning oven and a stone barbecue. Access to the house is along about 500 metres of untarred road in good condition. One side of the property lies alongside this country road, on the other side of which is the owner`s house. Both barns have central heating, air-conditioning, satellite-TV, washing-machine, dishwasher, safe deposit-box, stereo, telephone and internet connection. San Gimignano is 13 kms away, Firenze 35 kms, and Siena 23 kms. (FORNO+POZZO) GROUND FLOOR: living-room with fireplace/dining-room with TV with kitchen (oven, microwave, freezer, dishwasher), 2 bathrooms with shower, box-room with washing-machine. Down 6 steps to the sleeping area with 1 double bedroom, 1 twin bedroom with access to the outside. GROUND FLOOR: kitchen/dining-room (oven, freezer, dishwasher) with open loft with living-room with TV, fireplace and double sofa-bed, 1 twin bedroom, 1 bathroom with shower, box-room with washing-machine. FIRST FLOOR: 1 double bedroom, 1 bathroom with shower. Paid on site in cash: Tuscan dinners on request - extra cleaning and cook. Consumption of electricity is included up to 150 kw for version 8 +2, 75 kw for the 4 and 4+2.